“She’s so beautiful” are words Arthur Bess repeated upon seeing his six-month-old daughter for the first time. 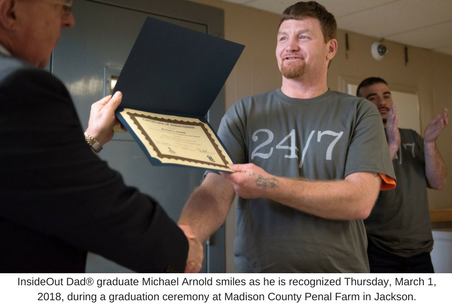 Bess and two other inmates, wearing shirts that said “24/7 dad,” were greeted by their kids and family members to celebrate their completion of the InsideOut Dad® program at the Madison County Penal Farm. 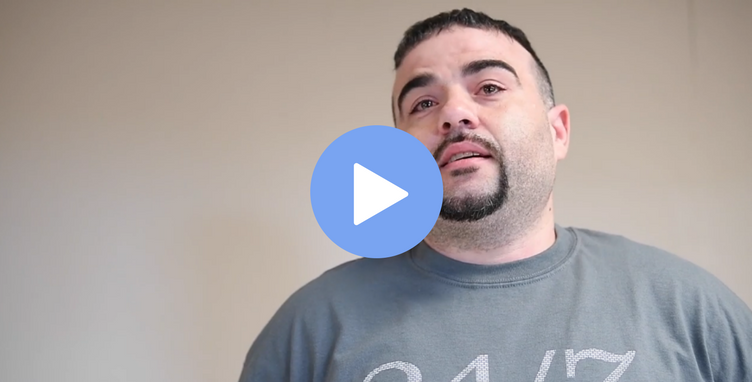 InsideOut Dad® is a curriculum from the Maryland based National Fatherhood Initiative, Southwest Human Resources Re-entry Coordinator Tim Carothers said. 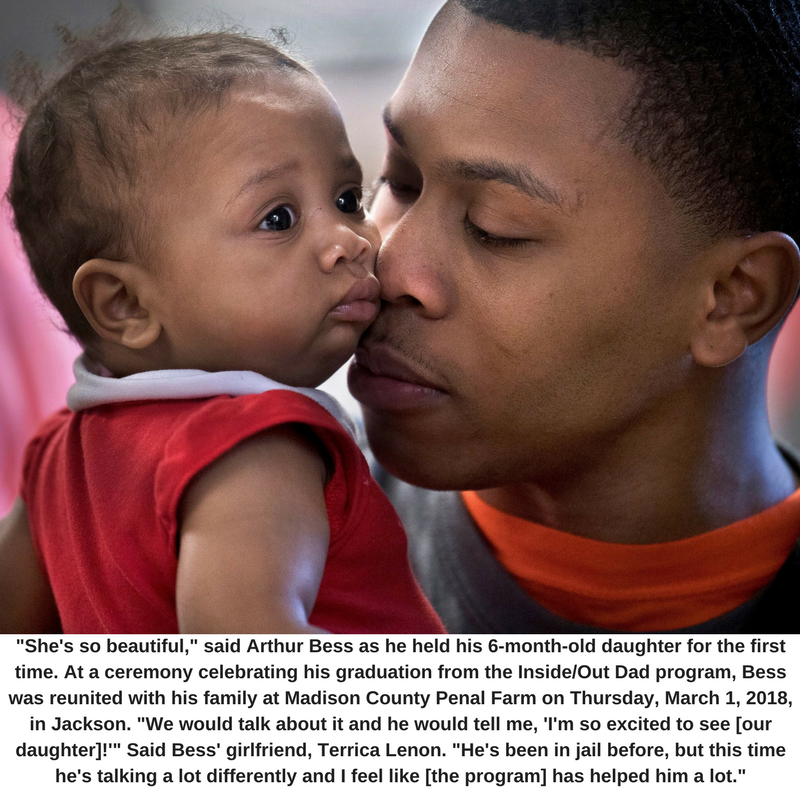 The class helps men become better fathers and spouses while reducing the recidivism rate in Madison County. Ryan Mills has been in and out of jail since he was 17 years old. Out of all the time he has served over the years, the 14 week Inside/Out Dad® program has made the most change in his life, he said. When asked if he’d like to participate in a dad program he was all-in, and once he found out the extent of the class, he was even more excited. The men made résumés, learned how to answer interview questions, how their thoughts influence their feelings and actions, and how to control them, among other things, to prepare them for life outside jail. Transitioning out of jail is hard, he noted. In the past, he’s fallen right back into his old ways by returning to the streets to make money. With these new resources, Mills knows this time will be different. Different for him and especially his kids. Lenon can see the same change in Bess, who has also been in and out of jail. This time is different, she added. When he gets out in June she is expecting him to do better on all fronts — because this time he actually wants to. InsideOut Dad® graduates reflect on the program at their graduation ceremony on March 1, 2018, at Madison County Penal Farm. It costs the county about $40,000 a year to house an inmate. Any program that helps reduce recidivism benefits the inmate and the taxpayers. Consequently, the program was created to help offset costs, Southwest Human Resource Agency Executive Director Mike Smith said. Out of the 125 men who have completed the program in the southwestern region of the state, only eight have gone back to jail, which is less than 10 percent, Smith added. With Madison County having a higher recidivism rate than the national average, at about 82 percent, Madison County Mayor Jimmy Harris said programs like InsideOut Dad® are crucial. The national average is about 66 percent, Smith noted. This article was reposted with permission from The Jackson Sun.